Washington, D.C., is a lovely city for bicycle glamour shots. While what might come to mind most readily are pictures of bikes and monuments, that is not entirely true. One of the spots where I’ve always wanted to take a glamour shot is by the bike mural at Big Wheel Bikes in Georgetown. This eye-catching sight is tucked into an alley just off of 33rd and M Street. Recently, Felkerino and I were out on our Rivendells and I took the opportunity for a couple of photos. Rivendells at the Big Wheel Bikes mural. 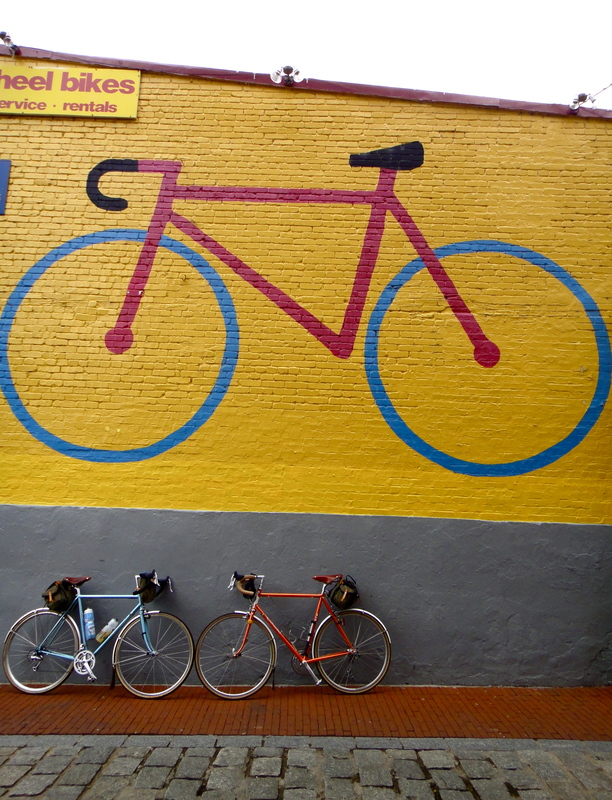 According to the Big Wheel Bikes website, “the big bike on the yellow wall is a Washington, D.C. landmark.” I don’t know about that, but I do think if you ever get the chance to have your bike photographed there, you should do it. We don’t have that many bike-specific murals in town. And see how nice the bikes look hanging out there? Felkerino and I also staged the photo below. While it looks like Felkerino is celebrating a grand cycling accomplishment, really we’re just coming back from a cup of coffee at Starbucks. Felkerino arrives at Big Wheel Bikes. Congratulations! 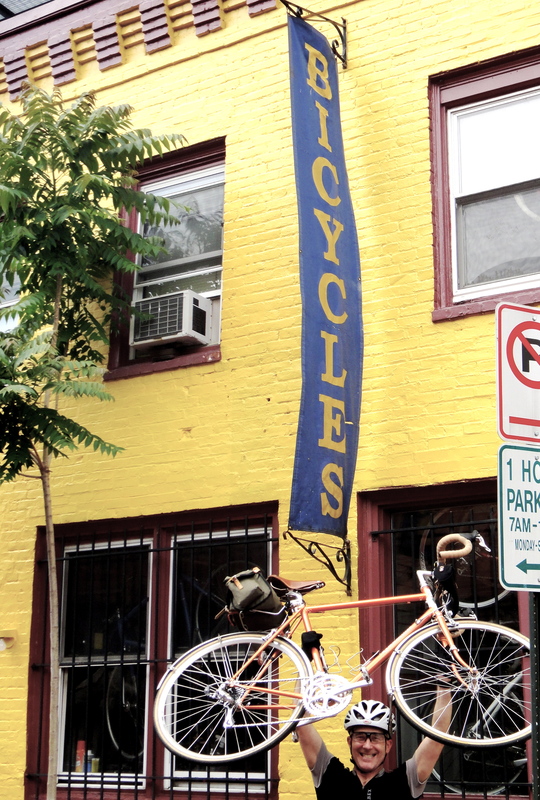 Like I said, if you’re looking for good glamour shot locations in D.C., Big Wheel Bikes in Georgetown is a definite must. Just make sure you go before 1. the weekend insanity kicks off; or 2. the weekday rush hour chaos ensues. You know how Georgetown gets. That’s where Betty was born! Lovely… I hope you had her portrait taken there, then!